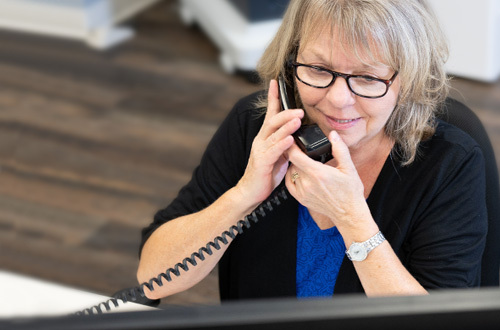 No more phone hopping or forwarded emails to put you in touch with the “right” customer service rep.
We use a team approach, combined with leading technology, so that every one of our team members has visibility into your shipment. And that means you can contact us at any point during your shipment and we’re always here to support you. Providing superior customer service is part of our DNA. Trust us to deliver, on time and within budget. We never prioritize technology over customer service. Rather, we use technology to boost our “customer-first” mindset, providing you with solutions that reduce impact to your bottom line, improve efficiencies, and provide transparency into your shipments. We track your freight with MacroPoint Tracking, giving us true “manage by exception” capabilities to reduce any impact to your business. Quick exchange of information is critical to our process. We utilize EDI (Electronic Data Interchange) to speed document exchange versus more traditional formats like mail or fax. We employ dynamic routing to close loops and backhaul our outbound equipment, providing you with the most options available. Custom reports provide transparency into your business. Our team works to understand your goals and provides reports that help you achieve them.